Quick Contacts : This program will help you make calls and send messages quickly. 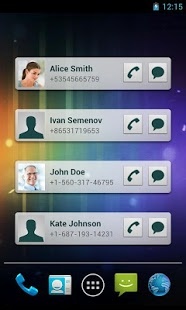 You can organize your contacts by using the groups interface. A good speed dial App! It is better than the native phone/people app. The best thing is that it displays the number too, which is missing in the native direct dial widget. Very easy yo use I was looking for a simple contact app and this one was by far the most simple to use. The only thing it lacks is color schemes, green isn’t my favorite color but oh well I still love the app.